New Delhi, April 8 (IANS) The BJP on Monday vowed to strengthen the armed forces and said it will continue to take "focused steps" to strengthen their "strike capability". The issue of national security figured prominently in the BJP's election manifesto as well as in the speeches of its leaders during its launch in the presence of Prime Minister Narendra Modi, party President Amit Shah and several union ministers. "Our security doctrine will be guided by our national security interest. This is exemplified by the surgical strikes and the air strikes carried out recently. We will firmly continue our policy of 'zero tolerance' against terrorism and extremism and will continue to follow our policy of giving a free hand to our security forces in combating terrorism," the party said in its manifesto. 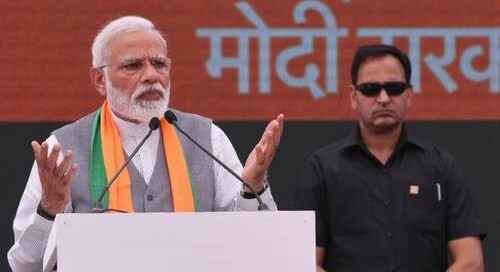 It said that the decisive leadership of Prime Minister Narendra Modi had fundamentally altered the national security paradigm of India in the last five years. "We will speed up the purchases of outstanding defence related equipments and weapons. In order to equip the armed forces with modern equipment, we will continue to take focused steps to strengthen the strike capability of the armed forces," the party said. In order to ensure self-reliance in procurement of defence equipment, the party pledged to continue its focus on 'Make in India in Defence' to enable indigenous production of defence equipment. "This will also generate employment and encourage investment in the defence sector," the party said. In February, India and Pakistan faced off in their worst confrontation in years after the Indian Air Force conducted strikes on Balakot in the aftermath of Pulwama terror attack that killed 40 CRPF troopers. Finance Minister Arun Jaitley said the BJP's manifesto had not been prepared with a 'tukde tukde' mindset but with a strong nationalist vision. "Our new policy, new doctrine of striking terror in its origin has received global recognition. This manifesto has been prepared with strong nationalist vision ... it is rooted in India's realities," he said. The manifesto also pledged to "expeditiously complete" the National Register of Citizens process in the areas where a huge change in the cultural and linguistic identity have taken place due to illegal immigration. "We will expeditiously complete the National Register of Citizens process in these areas on priority. In future we will implement the NRC in a phased manner in other parts of the country," the manifesto read. The party pledged to continue to undertake effective steps to prevent illegal immigration in the North Eastern states. "For this, we will further strengthen our border security. A pilot project on the use of technology to strengthen border security (Smart Fencing) was implemented in Dhubri (Assam). We will implement this on all borders," the party said. The party manifesto said that to facilitate easier trade and travel from the neighbouring countries, it will ease the movement of goods and people by constructing 14 more integrated checkposts by 2024. "After completion of all the proposed integrated checkposts, all trade movement with Bangladesh, Nepal and Bhutan will be conducted through the integrated checkposts," the manifesto said. Home Minister Rajnath Singh said: "We will not allow infiltration and will implement Citizenship Amendment Bill. We will not compromise on national security."